A few days ago I presented you with my randomly ordered list of the best songs a person might hear this time of year. Here is the sequel to that list, and it gives you the best movies. Also randomly ordered, this list is mine. It is purely subjective, hardly scientific, and most definitely open to scrutiny. For instance, you'll notice one movie many consider a Christmas classic is conspicuously absent. That movie is Christmas Vacation, and I simply can't sit through it. Proving that all comedy is subjective, I do not like Chevy Chase's brand of humor. I find him (and his dramatic counterpart, James Spader) completely off-putting. But I'm not here to tell you what I don't like. I'm here to tell you what I do like. There have been many versions of the classic tale by Charles Dickens. I was unable to make it to the theater to see The Man Who Invented Christmas this fall, but I'm sure I'll see it eventually. And in reading up on that movie, I discovered just how fortuitous the timing was of the publication of A Christmas Carol, as the holiday and all of the festiveness attached to it by today's standards was in its infancy. The story itself is one of a timeless lesson for the whole year: good will toward all. But the presentation and its simplicity of message is what has helped it stand the test of time. For this list, despite such notable actors as Patrick Stuart, George C. Scott, Scrooge McDuck, and Jim Carrey taking the lead as the humbug Ebenezer, it is the version featuring Alistair Sim that takes its place among the best movies. Made in 1951 and remastered into a colorized version some years later, the performances have stood the test of time. In fact, you could make the argument that this version of the story has grown in stature over the years and has become the bellwether by which all other Christmas Carol film adaptations are judged. For that reason alone, it deserves placement on my list. For many other reasons, it deserves placement on nearly any list. The cast of Saturday Night Live has churned out some memorable comedians in the past 40 years. Some of them have made Hollywood their own personal playground and enjoyed strong and diverse careers. Others, like Adam Sandler and Will Ferrell, enjoyed major early movie success but have seemingly taken that success and decided to play various versions of the same character over and over. Call their movies comfort food and just take them for what they are. Elf, a Ferrell flick, is so much more than that. Ferrell has done a variety of different things in his career, and not unlike some actors in Hollywood, too often we watch and say, "Oh, that's so-and-so as so-and-so." Not in Elf. In Elf, Will Ferrell was Buddy. Catching lightning in a bottle, Ferrell's portrayal of Buddy even made a crotchety James Caan believe in the spirit of Christmas. Plus, if you're a fan of movie quotes, Elf has plenty. And perhaps the one heard most this time of year in any given conversation concerning the big man in red? That's easy: "SANTA! I know him! I KNOW HIM!" Most parents say they know Santa. Buddy made us believe he really did know Santa. Doing anything on Christmas Eve? How about Christmas Day? No? OK, well, in that case, set aside about two hours and watch the story of Ralphie's quest for his Red Ryder BB Gun. To be perfectly honest, it took a long time for me to warm up to this movie. When it first started being shown on TV, I found it pretty difficult to get into, and I really don't remember why. I gave it another chance as a young 20-something as a favor to my wife, who ranks it pretty high among her favorites. I finally "got it" and since then have considered it a modern classic like most people. Who hasn't wanted that one toy that every adult has warned against? Who hasn't been triple dog dared? Who doesn't remember getting so bundled up to go play in the snow that you couldn't put your arms down? And I'll bet good money that at one time in our childhoods, we were warned about something taking our eye out, just like Ralphie. Filled with memorable lines, a great scene at a Chinese restaurant that may soon go the way of the censors, and quite possible a partially illiterate father (seriously, "fra-gee-lay? "), this movie has everything including the arrival of a major award. Worth at least one watch every December, and you can find an annual marathon of it on a few different basic cable channels. Enjoy! Bill Murray. Need I say more? Yeah? OK, I will. This modern retelling of A Christmas Carol is about as adult as it gets. 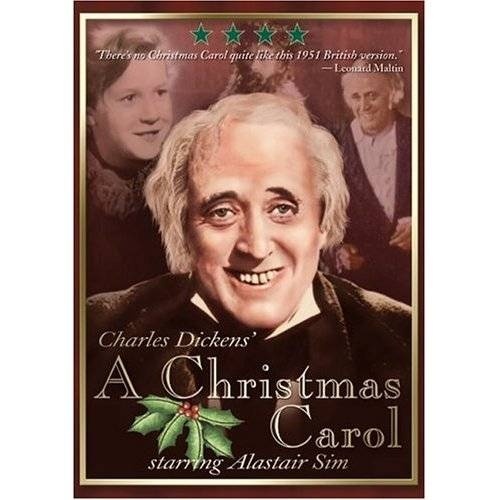 Since it is not called A Christmas Carol, I'm counting it as its own movie. My list, my rules. So much of this movie is just...ridiculous. And Murray is at the movie's core. If you spent any portion of your childhood in the 1980s, enjoyed Ghostbusters, or Groundhog Day, or Stripes, or Caddyshack, or any other movie with a prominent Bill Murray role, chances are good you'd enjoy Scooged. It's that kind of humor, and it's all about that Christmas spirit, that holiday feeling, and how we can enjoy it year-round. For years I put this one on lists simply because everyone else did. It took me a long time, far too long, in fact, to watch it from start to finish. I'm so glad I finally did. Jimmy Stewart was everything in Hollywood for a long time. A great actor who took on some great roles, and immersed himself in every one of them. As George Bailey, he created a lasting legacy that all people can look at for inspiration in their darkest times. It's a sad that this time of year is among the darkest for many, and as the Capra classic teaches, there are consequences we can't possibly fathom if we do not exist. For George, he helped Clarence get his wings by realizing that he had, in fact, had quite a wonderful life. And in the end, before it was too late, he understood that no man is a failure who has friends. I caught the end of this movie about a week ago. Maybe it was one of those nights, or maybe I just was feeling my humanity at that particular time, or maybe there was a major dust storm in the room where I was watching, but I got a bit teary eyed when all of Bedford Falls turned out to save George. In one of those Internet lists that likes to tell us all how old we really are, try this one on for size: Home Alone's release date is closer, historically speaking, to the moon landing than it is to today. Yeah. All kidding aside, this movie is completely unrealistic. After one or two of the booby traps set by Kevin catch Marv and Harry, they'd be in pretty bad shape. But the movie would have us believe two grown men can handle walking in the snow barefoot after puncturing one foot with a nail, or still being ok after getting conked in the head with a pretty full can of paint and knocked down a flight of stairs, or having our scalped singed and set ablaze by a blowtorch, among other things. Know what, though? As a movie, it works. Plus, as memes and gifs have become practically their own forms of communication, Home Alone has become a go-to for several catchphrases. Pro teams quote Kevin's pep talk near the end of the movie by reminding their fans, "This is my house! I have to defend it!" And if the phrase "ya filthy animal" isn't used by your or someone you know in everyday conversation this time of year, I feel sorry for you. The premier date for this movie was two weeks shy of the date my wife and I exchanged wedding vows. I had to look that up, but I suppose you could say the point is that this movie holds a special place on my Christmas movie list because of when it debuted at the box office. There are plenty of people who view this movie as overly sappy. Know what? I don't care. It's the standard for all of its unofficial sequels. Like Valentine's Day. And New Year's Eve. And probably Mother's Day. Yes, all three of those were movies. None hold up to the original. Hugh Grant is his Hugh Grantiest self. Billy Bob Thornton - as President of the United States (write your own jokes) - is at his Bad Santa best. Alan Rickman and Emma Thompson, and Liam Neeson (and his particular set of Titanic imitating skills), and Martin Freeman, and Colin Firth with his butchering of the Portuguese language, and Laura Linney, and Rick Grimes before the world turned into a zombie-covered nightemare, and the kid who grew up to mentor Bran in Game of Thrones in probably his most memorable role in which he proves Ringo shouldn't be forgotten in a performance that makes sure we will always have Mariah Carey's "All I Want For Christmas Is You" in the holiday rotation. Yup, Love Actually is great. The imitators that followed were way too predictable. Love Actually set the tone and it's yet to be equaled. So given the man's nearly 30-year run on our TV and movie screens, it's only fitting that he made a Christmas movie. Turns out one just wasn't enough, though, and he followed up with two more. The first Santa Clause movie is ok. In fact, I'm not sure I can see myself putting it on this list alone. As a trilogy, though, Allen's Santa Claus over the course of all three films is likely how we envision the jolly old fellow, whether we were raised with him in our lives or not. Personally, I like the second installment best of all, for it is when Scott Calvin realizes he might not get to continue being Santa Claus that he realizes just how rewarding a "job" it is. Ask any parent to view Christmas through their children's eyes and they'll tell you there is something magical about it that just can't be described. That feeling was captured by Allen's version of Santa, as he managed to make us feel what it must be like to be the one to bring joy to everyone this time of year. Nothing wrong with that. There are those who do not consider Die Hard a Christmas movie. I try not to associate myself with those people. - There is a big Christmas tree in the Nakatomi building. - John McClane lets Hans Gruber know, "Now I have a machine gun. Ho, ho, ho!" - The final scene of the movie ends with the song "Let It Snow." This guy in Dallas knows what's what. So as we mark the final days until reindeer are spotted over Western New York, Yippee-ka-yay to all, and to all a great rest of December marked with all the good in you lives. Howie Balaban wishes there were a good Hanukkah movie to put on this list, because the blink-and-you-miss-it scene in the first American Tail just isn't enough.